Well I’ve learnt a lesson this week. Actually, I’ve learnt a few, all in one go. Next morning I got up and went downstairs and just happened to glance out through the back doors. 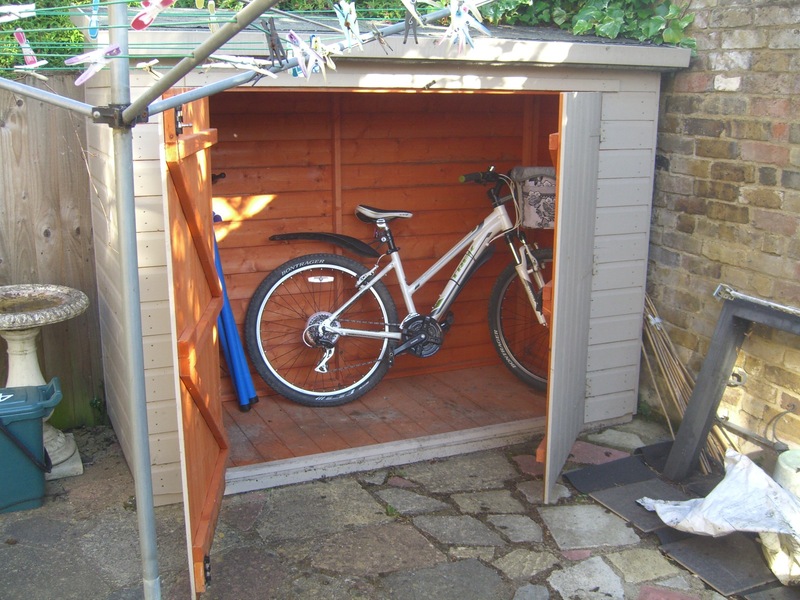 At this point I spotted that my shed doors were wide open and I could see that my bike was no longer there. OH NO! On investigation I found that the shed door lock was hanging off and although they still had to get it out of the garden, the gate padlock had also been removed. When I told my wife she said she’d also heard noises in the night but that she had woken up fully and knew it was coming from outside. But what she didn’t realise was that what she was actually hearing was my bike getting nicked. After that initial sick feeling, knowing that my prized possession was no longer in my care and control, (and thinking about how much it had cost me) I realised that a whole load of hassle was about to ensue: and I was right. Call the police; call the insurance; make a list of all of the accessories that were attached; look into how to get a new bike; buy locks; repair the shed; the list goes on. All the while feeling angry, upset and infuriated that someone thinks that its OK to come into my property and take my possession. Bastards! The good people at Evans Cycles were really helpful: they had the same bike still in stock and I’ve already been out and replaced it! So luckily I’m still mobile although I’m still missing some bits and pieces that I will get in due course. Its come as quite a surprise how many parts and accessories I’d added (shhh, don’t mention how much I’d spent…). Security, security, security. Get it sorted before you need it! As I’ve learnt to my cost, afterwards is too late. I’ve actually now added FIVE locks and an alarm to my overall security set up! Any future thief will have to be prepared to spend a good deal of effort and time, and risk making a row (let alone the alarm going off) if they want to relieve me of my possessions in future. But the most surprising lesson I’ve learnt is how bad it makes you feel. At the end of the day you’ve worked hard to earn the money to buy something (bike, watch, Picasso, it’s still your possession) and some scrote thinks they can just walk off with it. And the police have little chance of catching them so maybe they are right. You’re just left with an empty space where that item used to be, and an overwhelming sense of injustice at the unfairness of the world. In fact, I’m now ultra-aware of any odd noises coming from the general direction of “outside.” That’s the reason I’ve opted for the alarm because it will generate an unusual noise that can’t be mistaken for anything else. Other than that, the future is now in the lap of the gods so let’s keep fingers crossed eh? And if you’d do that for me too then that would much appreciated! Now its music time: I could have gone with the Bad Boys theme but this is my favourite Culture Club song so I decided to go with looking at things from my perspective. I’m not giving those thieving gits any more acknowledgement than I need to! Enjoy. ← LaBelle or Anita Ward? Sorry about your loss. Felt really sad and angry at the same time, just like you. Thanks for those 3 steps, they are great and everyone should follow them up. Thanks for the sympathy Hammad. Have a great day!